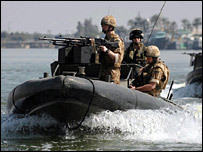 The Royal Navy said the group was on a routine patrol in Iraqi waters and were understood to be unharmed. But Iranian state television quoted the Iran foreign ministry as saying they had illegally entered Iranian waters. The Associated Press news agency is quoting US Navy official, Commander Kevin Aandahl, as saying that Iran's Revolutionary Guard were responsible. Mr Aandahl is also reported as saying the naval force had told them in a radio message that the British were not harmed. Foreign Secretary Margaret Beckett has demanded the immediate and safe return of the HMS Cornwall servicemen. She added that she had called for a "full explanation" from Iran and had left them in no doubt that she wanted the group and their equipment back immediately. The task force's commander, Commodore Nick Lambert, said he was hoping there had been a "simple mistake" over territorial waters. "There is absolutely no doubt in my mind that they [British personnel] were in Iraqi territorial waters. Equally, the Iranians may claim they were in Iranian territorial waters. "We may well find that this is a simple misunderstanding at the tactical level." Helicopters had reported seeing two British boats being moved along the Shatt al-Arab waterway to Iranian bases and there had been no evidence of fighting, he added. He said that despite scant communication, the 15 people were understood to be safe and had reacted in an "extremely professional way, in line with the rules of engagement". Mrs Beckett said: "We understand that they were in two boats that were operating in Iraqi waters in accordance with the Security Council Resolution 1723 in support of the government of Iraq to stop smuggling." On Friday afternoon, the Iranian ambassador in London, Rasoul Movahedian, met permanent secretary, Sir Peter Ricketts, at the Foreign and Commonwealth Office. The foreign secretary said the meeting had been "brisk but polite" and said the British ambassador in Iran had also been speaking to officials in Tehran. 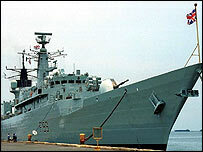 The MoD said it had contacted relatives of the group, which comprised eight sailors and seven marines. There has been no official response so far from Iran, where many ministries and official buildings were closed for a public holiday. However, state television has reported that the British envoy was summoned to Iran's foreign ministry. Shadow foreign secretary William Hague and Sir Menzies Campbell, leader of the Liberal Democrats, have both backed the call for the group's immediate and safe return. The incident comes at a time of renewed tensions with Iran over its nuclear programme and follows claims that most of the violence against UK forces in Basra is being engineered by Iranian elements. British army Colonel Justin Maciejewski, who is based in Iraq, said Iran was providing "sophisticated weaponry" to insurgents and "Iranian agents" were paying local men to attack British troops. Iranian officials have in the past denied such claims. The BBC's diplomatic correspondent James Robbins said the difference this time was that the present Iranian government under President Mahmoud Ahmadinejad was much more hardline. "The political climate is worse with Britain among those confronting Iran over its controversial nuclear programme," he added.